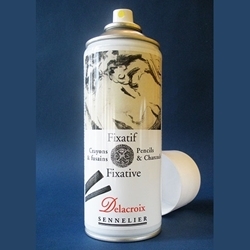 Sennelier Delacroix Fixative for Pencil and Charcoal - Delacroix fixative is the perfect spray fix to seal and protect pencil and charcoal drawings. This totally clear, non-yellowing matte film fully protects against smearing. Specially formulated for work in pencil, charcoal and graphite powder. While similar to Latour fixative, it is stronger and therefore not recommended for soft pastels. Due to hazardous shipping conditions we can not allow this product to ship internationally. We apologize for any inconvenience.